Contains Milk, Soy, Almond and Peanut. Manufactured in a Plant that processes Milk, Soy, Wheat, Tree Nut, Peanut and Eggs. Excessive consumption may cause a laxative effect. Protein Blend (Whey Protein Isolate, Whey Protein Concentrate, Whey Protein Hydrolysate), Vegetable Oils (Palm, Palm Kernel, Soybean), Vegetable Glycerin, Sugar, Soy Protein Isolate, Sorbitol, Maltitol, Water, Corn Syrup, Brown Rice Flour, Natural Flavors, Corn Cereal, Salt, Corn Starch, Soy Lecithin, Mono and Diglycerides, Whey, Vitamin A Palmitate, Beta-Carotene, Potassium Sorbate, Natural Color, Almond, Peanut, and Sucralose. Consume up to 3 bars per day between meals with appropriate fluid intake. Store at 55F-75F. Protect from heat, light and moisture. Do not purchase if seal is broken. Excess consumption may have a laxative effect. Contains Milk, Soy, Almond and Peanut. Manufactured in a plant that processes Milk, Soy, Wheat, Tree Nut, Peanut and Eggs. Protein Blend (Whey Protein Isolate, Whey Protein Concentrate), Vegetable Oils (palm, palm kernel), Sugar, Vegetable Glycerin, Milk Protein Isolate, Peanut, Gelatin, Sorbitol, Water, Maltitol, Pea Protein Isolate, Cocoa (processed with Alkali), Non-Fat Dry Milk, Caramel Color, Soybean Oil, Corn Syrup, Skim Milk, Natural Flavors, Soy Lecithin, Mono and Diglycerides, Whey, Salt, Butter, Vitamin A Palmitate, Beta-Carotene, Potassium Sorbate, Almond and Sucralose. Protein Blend (Whey Protein Isolate, Whey Protein Concentrate, Whey Protein Hydrolysate), Vegetable Oils (Palm, Palm Kernel, Soybean), Vegetable Glycerin, Soy Protein Isolate, Sugar, Sorbitol, Maltitol, Cocoa (processed with Alkali), Water, Brown Rice Flour, Evaporated Cane Juice, Natural Flavors, Tapioca Starch, Soy Lecithin, Salt, Chocolate Liquor, Mono and Diglycerides, Whey, Baking Soda, Vitamin A Palmitate, Beta-Carotene, Potassium Sorbate, Almond, Peanut, and Sucralose. Protein Blend (Whey Protein Isolate, Whey Protein Concentrate, Whey Protein Hydrolysate), Vegetable Oils (Palm, Palm Kernel, Soybean), Vegetable Glycerin, Soy Protein Isolate, Sugar, Sorbitol, Maltitol, Water, Brown Rice Flour, Tapioca Starch, Cinnamon, Natural Flavors, Molasses, Non-Fat Milk Solids, Whole Milk Solids, Soy Lecithin, Salt, Mono and Diglycerides, Whey, Baking Soda, Caramel Color, Xanthan Gum, Annatto, Vitamin A Palmitate, Beta-Carotene, Potassium Sorbate, Almond, Peanut, and Sucralose. Protein Blend (Whey Protein Isolate, Whey Protein Concentrate, Whey Protein Hydrolysate), Vegetable Oils (Palm, Palm Kernel, Soybean), Vegetable Glycerin, Soy Protein Isolate, Peanuts, Sugar, Sorbitol, Maltitol, Water, Brown Rice Flour, Reduced Whey Mineral Powder, Natural Flavors, Soy Lecithin, Salt, Mono and Diglycerides, Whey, Vitamin A Palmitate, Beta-Carotene, Potassium Sorbate, Almond, and Sucralose. Protein Blend (Whey Protein Isolate, Whey Protein Concentrate, Whey Protein Hydrolysate), Vegetable Oils (Palm, Palm Kernel, Soybean), Vegetable Glycerin, Soy Protein Isolate, Sugar, Sorbitol, Maltitol, Peanuts, Water, Brown Rice Flour, Non-Fat Dry Milk, Cocoa (processed with Alkali), Caramel Color, Corn Syrup, Skim Milk, Natural Flavors, Soy Lecithin, Salt, Butter, Mono and Diglycerides, Whey, Vitamin A Palmitate, Beta-Carotene, Potassium Sorbate, Almond, and Sucralose. Protein Blend (Whey Protein Isolate, Whey Protein Concentrate), Vegetable Oils (Palm, Palm Kernel), Sugar, Vegetable Glycerin, Maltitol, Milk Protein Isolate, Gelatin, Sorbitol, Water, Cocoa (Processed With Alkali), Rice Flour, Pea Protein Isolate, Evaporated Cane Juice, Natural Flavors, Soy Lecithin, Soybean Oil, Tapioca Starch, Whey, Mono and Diglycerides, Chocolate Liquor, Salt, Beta-Carotene, Vitamin A Palmitate, Baking Soda, Potassium Sorbate, Almond, Peanut, and Sucralose. Protein Blend (Whey Protein Isolate, Whey Protein Concentrate), Vegetable Oils (Palm, Palm Kernel), Sugar, Vegetable Glycerin, Maltitol, Milk Protein Isolate, Gelatin, Sorbitol, Water, Natural Flavors, Tapioca Starch, Pea Protein Isolate, Soy Lecithin, Cinnamon, Soybean Oil, Rice Flour, Molasses, Salt, Whey, Mono and Diglycerides, Vitamin A Palmitate, Beta-Carotene, Baking Soda, Caramel Color, Xanthan Gum, Potassium Sorbate, Annatto, Almond, Peanut, and Sucralose. Protein Blend (Whey Protein Isolate, Whey Protein Concentrate), Vegetable Oils (Palm, Palm Kernel), Peanut, Sugar, Vegetable Glycerin, Milk Protein Isolate, Gelatin, Sorbitol, Water, Maltitol, Pea Protein Isolate, Soybean Oil, Reduced Mineral Whey Powder, Soy Lecithin, Natural Flavors, Salt, Whey, Mono and Diglycerides, Vitamin A Palmitate, Beta-Carotene, Potassium Sorbate, Almond, and Sucralose. Protein Blend (Whey Protein Isolate, Whey Protein Concentrate), Vegetable Oils (Palm, Palm Kernel), Sugar, Vegetable Glycerin, Milk Protein Isolate, Peanut, Gelatin, Sorbitol, Water, Maltitol, Pea Protein Isolate, Cocoa (processed with Alkali), Non-Fat Dry Milk, Caramel Color, Soybean Oil, Corn Syrup, Skim Milk, Natural Flavors, Soy Lecithin, Mono and Diglycerides, Whey, Salt, Butter, Vitamin A Palmitate, Beta-Carotene, Potassium Sorbate, Almond, and Sucralose. Protein Blend (Whey Protein Isolate, Whey Protein Concentrate, Whey Protein Hydrolysate), Soy Protein Isolate, Vegetable Oils (Palm, Palm Kernel, Soybean), Vegetable Glycerin, Sorbitol, Maltitol, Sugar, Water, Pea Protein Isolate, Cocoa (Processed With Alkali), Brown Rice Flour, Natural Flavors, Salt, Sunflower Lecithin, Mono and Diglycerides, Whey, Potassium Sorbate (preservative), Tapioca Starch, Vitamin A Palmitate, Beta-Carotene, Almond, Peanut, and Sucralose. Oct 18, 2016 ProSupps MyBar: Protein Bar that’s BETTER Than a Candy Bar! 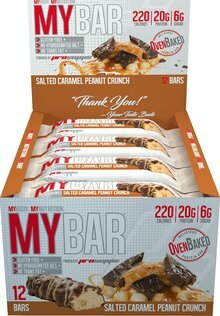 ProSupps MyBar is a protein bar that's not the same as all the other protein bars coming out this year. It actually tastes BETTER than a candy bar! Read the most up-to-date information on our MyBar blog post! What is MyBar Protein Bar? MyBar… you can FINALLY have your cake and eat it too! 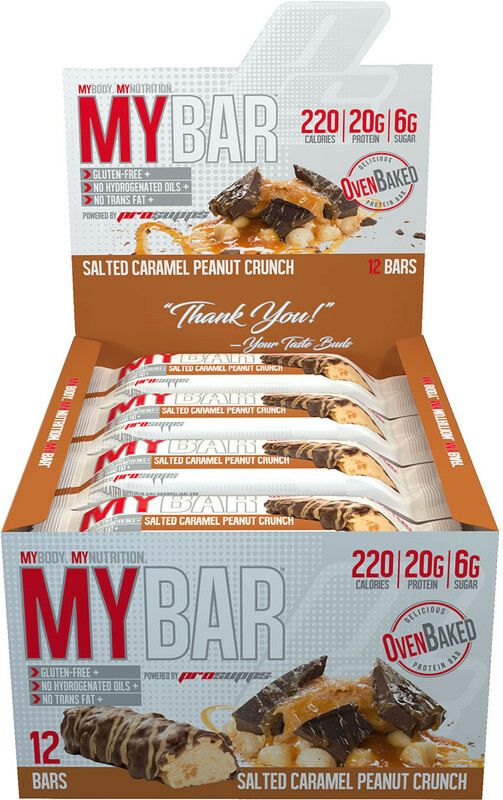 MyBar is a soy protein-free, gluten-free, absolutely delicious addition to your "on-the-go" active lifestyle. Whether you are running on the treadmill or running through the airport, MyBar will be with you , every step of the way!